In Eastern Africa, it is estimated that the population will be made up of three primary religious groups in 2020: Christianity (67.0%), Islam (21.4%), and Ethnoreligionists (10.5%). This is according to the Center for the Study of Global Christianity and the report, “Christianity in its Global Context, 1970–2020: Society, Religion, and Mission,” available for download here. 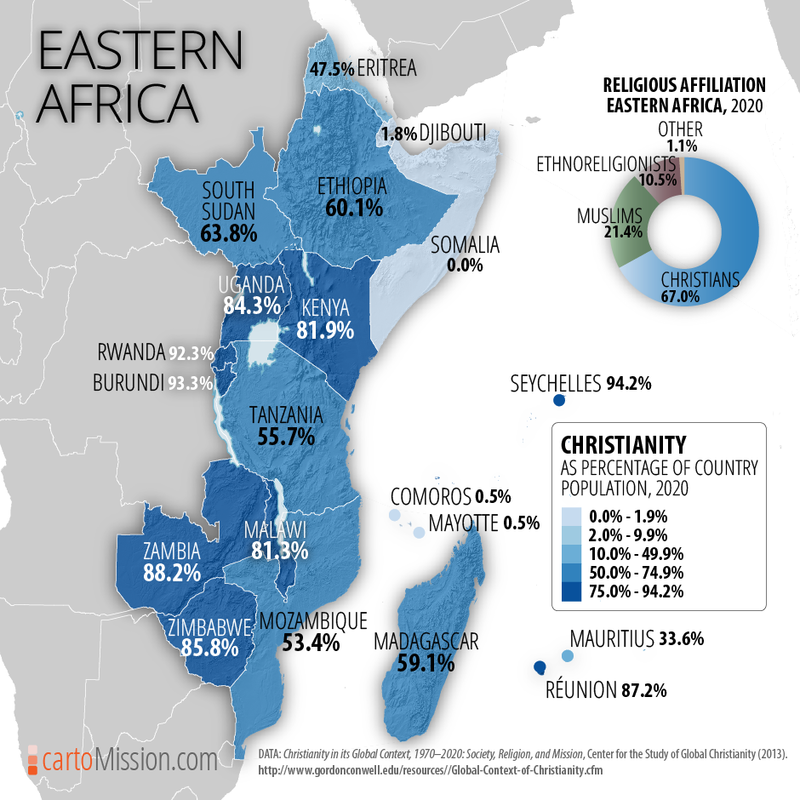 Nine of the twenty nations in the Eastern Africa region will be 81% Christian or higher, with the Seychelles, Burundi, and Rwanda topping the list. The countries with the lowest percentage of Christians in 2020 will be Somalia (with about 4,200 Christians), Mayotte, Comoros, and Djibouti. The largest countries by total population are estimated to have the following Christian percentages in 2020: Ethiopia (60.1%), Tanzania (55.7%), Kenya (81.9%), and Uganda (84.3%).